ButterRum has raised wing buds so I know her molt will happen soon. I'm hoping that when I come back from work, she will have molted, we'll see. 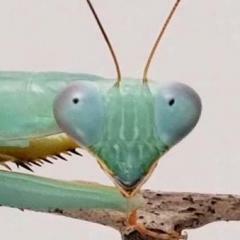 Mama Hierodula mated again, but I don't think anything will come of it. I'm gonna put my male back in his enclosure because she keeps bringing all the boys to the yard (let me know if you sang the song haha). Have a good day everyone!